ESO Supernova Exhibition — What does the ultraviolet unveil? What does the ultraviolet unveil? At short ultraviolet wavelengths, light has high energy. This kind of radiation is emitted by hot objects. Therefore, astronomers observe ultraviolet light to study hot stars and gas clouds. Galactic neighbour: Observed at visible wavelengths, the Andromeda Galaxy, at a distance of 2.5 million light-years, very much resembles our own Milky Way. Hot or not: This ultraviolet image of the Andromeda Galaxy reveals numerous hot stars in the spiral arms. Cooler stars populate the galaxy’s central bulge. Far-flung clusters: Using NASA’s GALEX ultraviolet space telescope, astronomers discovered clusters of young, hot stars in the outer reaches of the galaxy Messier 83. Our Sun emits most of its energy at visible wavelengths. Hotter stars, however, are brightest at shorter, ultraviolet wavelengths, where the photons carry much more energy. To study hot stars like white dwarfs, or hot, tenuous clouds of gas in intergalactic space and in colliding galaxies, astronomers need to use ultraviolet detectors. Most of the harmful UV radiation from the Universe is blocked by ozone in our atmosphere (thankfully! ), so ultraviolet observations need to be carried out from space. 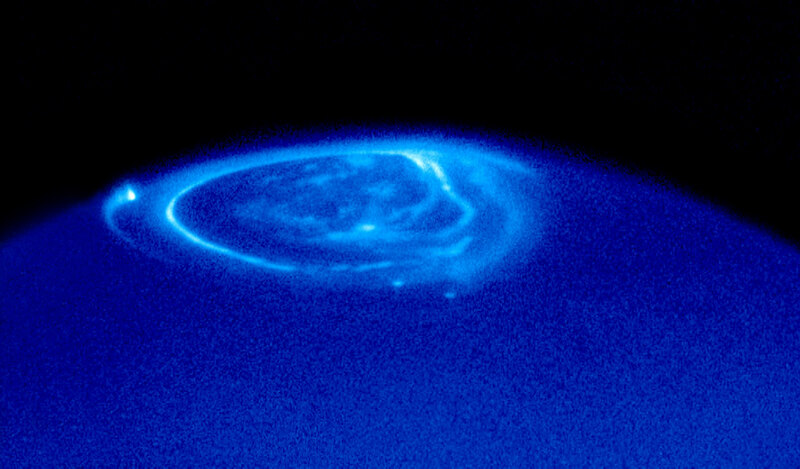 Giant aurora: Unlike aurorae on Earth, Jupiter’s northern lights do not glow at visible wavelengths. However, they are bright in the ultraviolet. Have you ever had sunburn? Ultraviolet light from the Sun causes this. It carries a lot of energy. Hot objects in space also give off ultraviolet light.